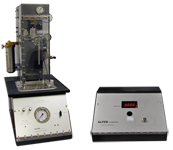 The MODEL 9408D2 Hydrostatic Tester is used to test the buckle and burst pressures of CSMA 1" curl aerosol cans. The 9408D2 tests top dome buckle, bottom buckle, and double seam burst pressures for aerosol cans. When used with an optional Change Part, the 9408D2 can also test aerosol can side seam or side wall failure. An aerosol can is mounted in the 9408D2 tester and pressurized with water. At various stages of pressurization the can will buckle, and if applicable, eventually burst. Pressures are indicated on the digital display of the monitor mounted at the top right of the unit.